I haven’t done the math, but I would be willing to bet no other place in the world can match Piedmont for its sheer concentration of world-class restaurants, most of which are located within a few kilometers from each other. Nestled in the heart of Barbaresco, Campamac is the newest addition to Piedmont’s glorious dining scene. 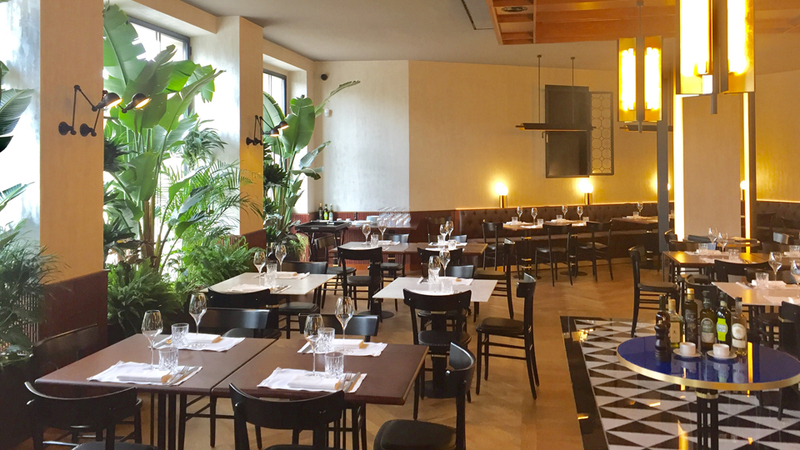 A distinctly stylish, Italian version of a bistrot, Campamac is a partnership between Chef Maurilio Garola and his wife, Cecilia Monte, and entrepreneur Paolo Dalla Mora. Garola and Monte are one of the two couples who run the massively successful Ciau del Tornavento in Treiso, where I had a spectacular dinner the night before. Dalla Mora’s experience lies mostly in larger industry, but he is now married to Rossana Gaja and has built more recent roots in Piedmont. More importantly, his passion for all things food and wine is infectious. Although the atmosphere may seem casual at first glance, Campamac embodies the single most quintessential attribute of Italian culture that no other country comes close to: effortless, informal elegance. Guests can have a simple, quick meal, as we did, or settle in for something more elaborate. The various cuts of meat that are aging on the premises are the first sign that food is taken very seriously at Campamac. A large glass window looks into the gleaming, state of the art kitchen. Garola and Chef Alessandro Capalbo have created a menu that offers an enticing combination of classics and more modern dishes. Dalla Mora has sprinkled in a few choices from his native Friuli, including prosciutto San Daniele and the more cultish prosciuttos of the D’Osvaldo family of Cormòns. Campamac’s wine list is small but well chosen. I visited just a few days after opening, and am sure the choices will improve over time. Unfortunately, I squeezed this lunch in between tastings, otherwise I would have been delighted to try more dishes. The San Daniele prosciutto, served over homemade focaccia, was a great start to lunch. After a week of eating a steady diet of Piedmont staples I was thrilled to try something different. The potato and leek ravioli hit the spot. 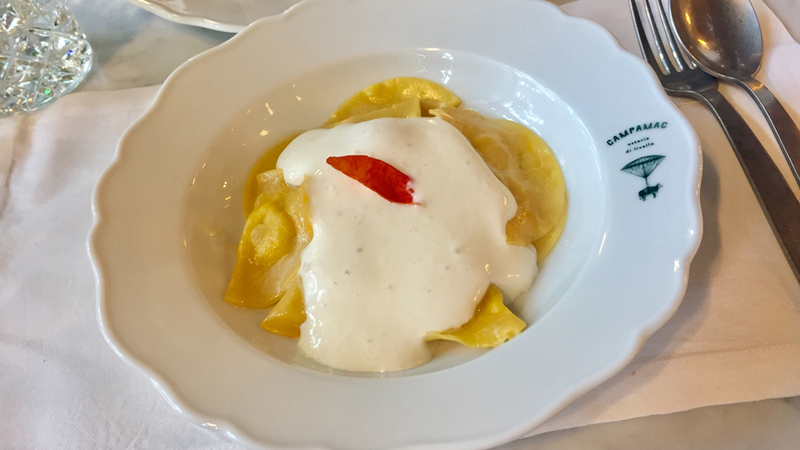 Soft, flavorful and perfectly cooked, the ravioli were sublime. I especially like the combination of the potatoes and leeks with the foam sauce made from Tuma, a soft cheese from Piedmont’s Alta Langa district, a region that is increasingly gaining attention for its sparkling wines, cheeses and hazelnuts. 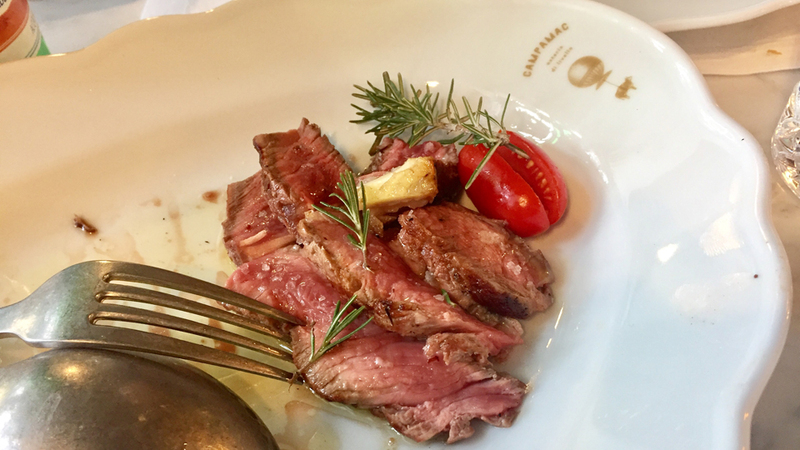 Fassona is a local breed of Piedmontese beef known for its delicate texture and flavor. My guest and I shared a single portion, which was more than enough for a simple, light lunch. The Fassona was cooked perfectly, with a light crust on the outside and medium on the inside, with the mellowness that is a sign of proper aging. 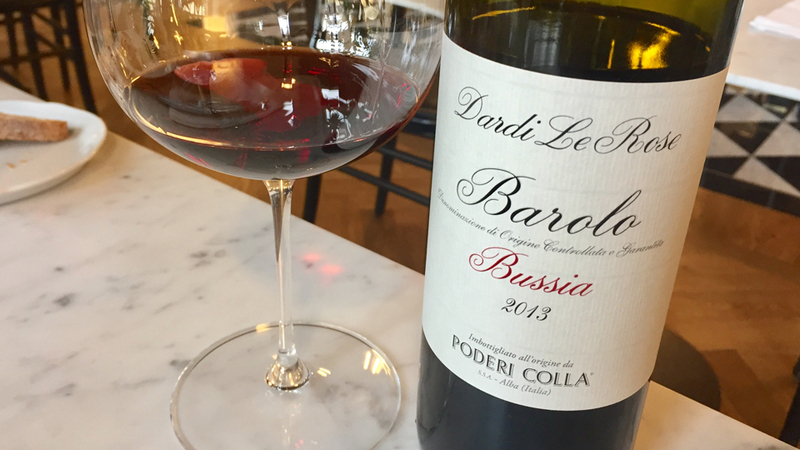 Poderi Colla has bean on a tear of late. I was thrilled to find their 2013 Barolo Bussia Dardi Le Rose on the list for a very reasonable 50.00 euros. Soaring and gracious on the palate, with captivating Nebbiolo aromatics and fine structure, the 2013 was every bit as compelling as it was when I last tasted it a few months prior. It was also perfect with the food. We skipped dessert, as a full afternoon of tasting appointments awaited. At their best, food and wine in Piedmont have an uncanny ability to deliver serious flavor intensity and complexity with no excess weight. That was certainly the case here. I can’t wait to get back to Campamac to try more of the menu. Readers visiting the Langhe will want to make a point of stopping by for lunch or dinner.